When Rob Holder from Great American Opportunities was hosting a fundraising program featuring the Xpogo Stunt Team as their special performance, they choose AmpliVox Sound Systems to reinforce the emcee and live event. The Xpogo Stunt Team is a collection of some of the best Pro Riders on the planet, who have come together to provide the thrill of extreme pogo in a show-based format to audiences worldwide. Flying over 10 feet in the air on extreme pogo sticks throwing down flips and incredible tricks, the Stunt Team has performed in 17 countries, holds 13 Guinness World Records, and has appeared in 100+ media features. Xpogo Stunt Team provides a blend of entertainment and athleticism that is incredible to witness live. During an extreme pogo school demo, the emcee relied on the SW915 Digital Audio Travel Partner with a S1297 Satellite Wireless Powered Dual Speaker for sound support, keeping the audience pumped during the performance. With the embedded BlueTooth connectivity, you can play music remotely from your iPod or iPad. You can even plug in a musical instrument or an audio mixer to support your band practices and competitions. One of our favorite annual traditions, the team at AmpliVox takes a step back from their busy lives to give thanks for the many gifts that we often take for granted and to focus on what truly is important... our friends, family and each other. AmpliVox CEO Don Roth gives thanks to his crew by hosting an annual turkey giveaway in the spirit of Thanksgiving, offering the staff their choice of a turkey or ham to take home for the holidays. Our offices will be closed Thursday, November 24th and Friday, November 25th. Multimedia equipment options come in all shapes, sizes, and configurations to meet an infinite variety of needs. That abundance of gadgetry, along with customized support furniture and accessories, can overwhelm purchasers — and their budgets. It’s refreshing in this environment of extreme specificity to find products that have the versatility to work with many different applications. By keeping it universal, these adaptable products enhance the technologies they support and maintain their value as devices evolve. AmpliVox Sound Systems follows that philosophy with its Rack Mount Line Array Speakers (S/SS/SW1234 and SSB/ SWB1240). Built in the U.S., these compact speaker systems are specifically designed to be easily compatible with video equipment and other interactive devices, integrating top-quality sound amplification with seamless application. With its efficient size and convenient mounting options, the Rack Mount Line Array Speaker has been adopted by a number of multimedia equipment manufacturers as their preferred audio accessory. The following case studies detail the successful integration of the Rack Mount Line Array to specific tech applications. The Marvel Group, a manufacturer of versatile office and education furniture, wanted to offer integrated, rack-mounted sound equipment with its Vizion line of presentation furniture. Marvel approached AmpliVox about adapting the Rack Mount Line Array Speaker to fit a variety of furniture options, with a focus on making the equipment easy for users to access and adjust. AmpliVox met the challenge by developing the Duo Tandem Line Array, a two-piece configuration that places the controls for the sound system conveniently at the presenter’s fingertips while the speaker directs sound toward the audience. In this unique design, the enclosed Duo Tandem system includes separate speaker and amplifier modules, with the speaker unit facing toward the audience and the amp’s control panel facing toward the presenter. Installed in Marvel products including the Benchmark Four-Shelf Presentation Cart, the Mobile Multimedia Cart, the Multimedia Lectern, and more, the Duo Tandem Line Array makes it easy for the presenter to see and operate the amplifier’s controls in action. The system is available with AmpiVox’s 16-channel UHR wireless receiver for perfect sound clarity without interference from competing frequencies. The Duo Tandem Line Array has also been used to great effect with the Presenter’s Assistant for Learning (PAL) multimedia cart from Bretford Manufacturing. This mobile cart, equipped with the Duo Tandem system, was selected by IT solution provider Emtec during a major technology upgrade for the Duval County Public School District in Jacksonville, Fla., the 19th largest school district in the nation. AVTEQ manufactures high-end media support furniture for teleconferencing equipment, used in settings ranging from intimate conference rooms to massive lecture halls. AVTEQ chose to AmpliVox Rack Mount Line Array Speakers to provide the audio complement to the advanced video technology used by customers. The universal rack mount design of AmpliVox’s system made it a natural choice to complement AVTEQ’s furniture. It was made available with a number of AVTEQ products, including the RPS line of LCD/plasma carts. "AVTEQ was very happy to find a true rack mounted speaker solution in a 2RU form," said Aaron Rubner, AVTEQ director of sales. "The AmpliVox Line Array performs perfectly in the videoconferencing cart solutions we offer. This will continue to allow our dealer base to provide their customers with a complete solution." Interactive whiteboards are another common presentation tool that can be enhanced with AmpliVox’s Line Array Speaker. With its compact size and ability to be mounted horizontally or vertically, the Line Array fits seamlessly with a variety of whiteboard products. Whiteboard manufacturer MasterVision offered AmpliVox Line Arrays in a paired, vertical configuration to its wall-mounted products, while Bretford Manufacturing added a horizontally-mounted Line Array atop its EXPLORE line of interactive whiteboard carts. 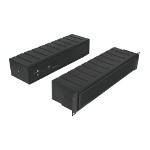 These are just a few examples of the function and utility offered by AmpliVox’s Line Array Soundbar systems. Forward-thinking design and a focus on adaptability make it an easy audio-equipment choice for furniture manufacturers, dealers, and customers. Engineered and manufactured to achieve outstanding performance, these speakers greatly enhance the effectiveness of presentations systems in classrooms, offices, media rooms, and event venues. High school marching bands and color guard groups from around the Pacific Northwest rolled into Sunset Chev Stadium in Sumner, Washington on Saturday October 29th 2016 to compete in the areas of musicianship and performance. Sumner High School Spartan Band performed at the Sunset Festival of Bands as the host band, playing the National Anthem and performing their Field Show with a little help from the AmpliVox SW915 Digital Audio Travel Partner. "I just wanted to share the video from our field show competition on Saturday" said Tom Fuge, Vice President of the 2016-17 Sumner Band Parents Association. "We have been putting the system to the test all fall. In this video we have 3 mallet instruments mic'd through the unit and then a special solo at the end." We have another show, the big finale for the season, this Saturday. Then the unit will be put away until probably winter drum line. Thank you for all your assistance with getting this unit purchased! I have a feeling I may be contacting you again for more equipment in the future." Our Autumn Season Sale is spreading holiday cheer a little early this year. This gorgeous presentation center is made of scratch resistant melamine with radius corners and sculpted lines for durability and beauty. Its fold up table is instantly ready for projector or other multimedia device. It features a four inch locking drawer for your laptop and a locking cabinet with adjustable shelf for other AV equipment. Project your image with style using the AmpliVox Elite Lectern. This sleek elegant lectern features a slim profile and attractive radius corners. Its scratch resistant melamine laminate finish and rugged construction make it stand up to lots of hard use. Made in the USA, the AmpliVox Elite lectern features a six year warranty. Teachers! Thanksgiving is right around the corner, but before your class breaks to spend time with friends and family, why not win some exciting classroom technology for your school? The education technology and furniture dealer is running their fifth annual Turkey Coloring Contest from now until November 18 for grade school and high school classrooms across the country. To enter, simply print out this year’s SchoolsIn turkey, let your students unleash their design skills to color the best bird, and mail in the creations for a chance to win more than $8,000 worth of prizes. As a contest sponsor, one lucky high school class will win an AmpliVox Sound Systems Mity-Meg Megaphone with microphone. Featuring three unique sound modes — talk, siren, and whistle — the Mity-Meg Megaphone allows you to maintain control and give direction in any situation, which is vital in fostering a safe and positive learning environment for students. How do you find the right PA system to clearly reach every set of ears with your message? AmpliVox products helps you reach audiences from 10 to 10,000 with strong clear sound. There precisely engineered with integrated amplifier and speakers to give you the audio power and clarity you need to reach every set of ears in the audience. Amplifiers range from 5 watts of power up to 250, and AmpliVox works with leading speaker manufacturers such as Jensen to ensure the best sound quality. If you are not sure what you need, use this sound comparison guide or reach out to AmpliVox experts. AmpliVox CEO Don Roth flying the "Cubs Win Flag"
AmpliVox CEO and longtime Cubs fan Don Roth rejoices in World Series win after a lifetime of waiting. Chicago Cubs finally coming home carrying the 2016 trophy. Their victory endend a 108-year "curse". A very special THANK YOU goes out to the Cubs' President of Baseball Operations Theo Epstein for getting the job done.